Note: Diamond Control X is no longer under active development, as I neither have a compatible monitor, nor one where such a program is necessary. The source is available below, licensed under the BSD licence, for those who may wish to continue development. 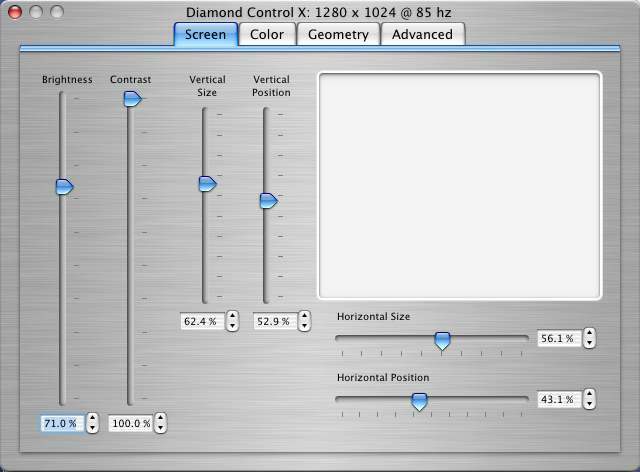 Diamond Control X is a Mac OS X application to manipulate the software accessible picture controls of supported monitors via USB. This is much easier and faster than using the on-screen controls, in addition to providing the ability to revert your settings to what you had previously if you don't like the result of your changes. A number of monitors have a USB interface to their picture controls. This interface typically conforms to the USB Monitor Control Class specification, a type of USB Human Interface Device (HID) just as keyboards and mice are. Through this interface, software can theoretically manipulate nearly every parameter that can be adjusted through the on-screen menus, assuming all controls are made available in this way. I'm making the source available in the hope that it may be useful to someone. I have commented it thoroughly, so it should be easily understandable. Note, however, that this is my first real Objective C/Cocoa application, so it may have some design quirks a more experienced programmer would have avoided. Diamond Control X is no longer under active development (see above). Version 2.0 beta 1 has been stable in my experience, and I have not had any reports of problems. It represents the current state of the program's development. For those who require closure, version 2.0 beta 1 as it presently exists can be considered version 2.0 final. Supports only the Mitsubishi Diamond Pro 900u Monitor (only monitor the author has access to).